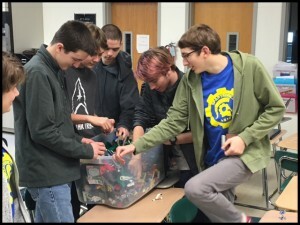 Robot design process continues as build season begins! Today is the second day FIRST released this year’s game. Our team is working hard towards a comprehensive design that would be able to complete the challenge – FIRST Stronghold. Now we are working on building prototypes with LEGOS to share our design ideas with the rest of the team. Over the next week we will continue to prototype, finalize our design, and begin to build!